Thella, Mr. O. M. Robertson. Was one of the original members of the Gourock Yacht Club, in the first year of which he was elected Vice-Commodore, and continued as an active member of the committee for a number of years. He was born in 1876 at Gourock, and educated at the central school there. 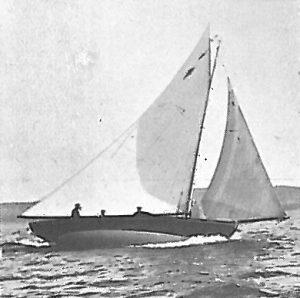 He commenced cruising in 1888 with Flying Fish, 2 tons, and has since owned the Freya, 6-rater, Dora, 4 old-rater, Thella, 4 old-rater, all of which were very successful racers. Mr. Adam sold Thella in 1906. Clubs : Gourock, Holy Loch Sailing, Largs Sailing. Residence : Park-lea, Gourock, N.B.